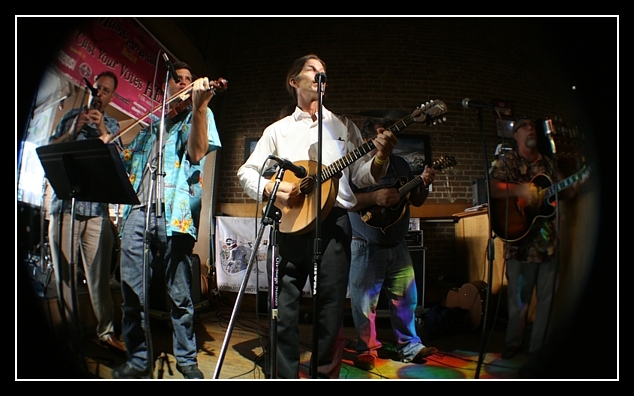 The Flying Fish Sailors were voted Houston’s Best Tradtional Folk Act in the 2008 Houston Press Music Awards! Thanks to all our fans who voted and everyone who continues to support us after all these years! Folk music might be an acquired taste for some, but Flying Fish Sailors have found a way to bring that traditional sound to the masses, with lively melodies and clean, unencumbered harmonies. No subject is too small for the likable quintet, whose songs Sunday touched on themes ranging from death and war (“The Flu Pandemic”) to cats (“My Big Cat”). The Sailors’ songwriting is very witty and smart; it’s not easy to write about things like mythical creatures and have it appeal widely to an adult audience. 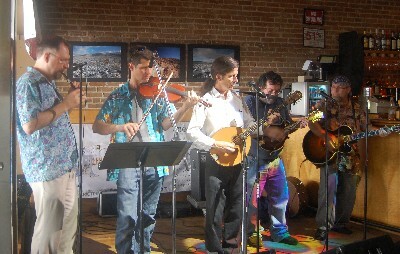 The band’s showcase performance drew a sizeable number of people, equal parts devoted fans and newcomers. The group’s commitment to its music really came through onstage, especially during “Loch Ness Monster.” The set was instantly contagious, and by the end, there wasn’t a non-smiling face in the crowd. Thanks to everyone who came out to the Houston Press Music Awards Showcase on Sunday! Looks like voting has closed. Wish us luck! We’ll be playing at the Awards showcase on July 27th from 4:00-4:45 pm at Dean’s Credit Clothing located at 316 Main St. in downtown Houston.